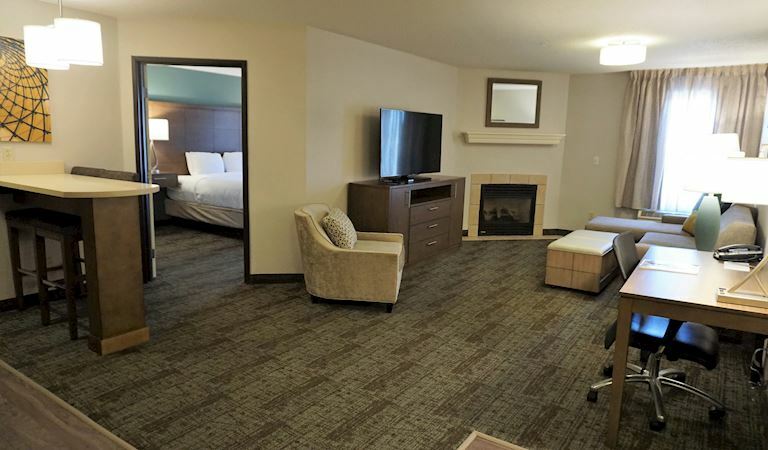 Check into your spacious suite at Staybridge Suites Columbia and you're guaranteed a traveling experience that's second to none. From premium Beautyrest bedding to newly renovated and fully equipped kitchens, complete with cookware, plates, glasses and silverware to stylishly appointed living rooms with sofa sleepers and large workspaces to our well-appointed bedrooms and baths, you can work and stay connected with complimentary WiFi or just relax the night away - on your own, with your family and friends or even just your favorite four-legged friend. 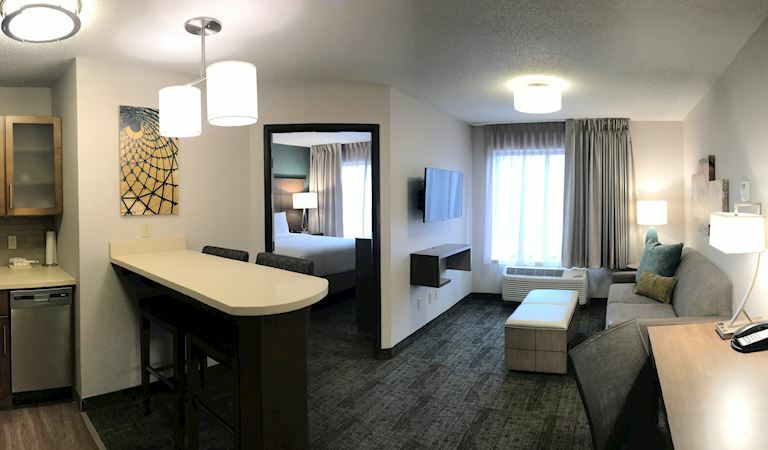 Come book your suite life at Staybridge today. The Studio Suite 1 King space works for business and leisure travelers. Start the day with a bite in the fully equipped kitchen and come back to a king-size premium bed at night. Stay connected with free WiFi, a flat screen TV and large workspace. Plus, with the sleeper sofa, it can accommodate up to 4 guests. 423 sq.ft. 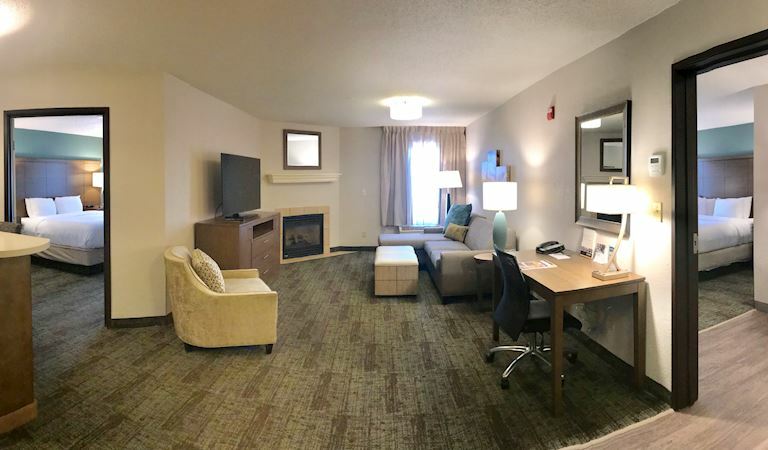 Get comfortable in the 1 Bedroom suite that offers a premium Queen sized bed in the well appointed bedroom and a full size sleeper sofa in the separate living room located on the first floor for easy mobility. Full kitchen with cookware and dining area and workspace complete with free Wifi and phone, you'll feel right at home. 461 sq. ft.
What could be nicer than curling up in front of a roaring gas fireplace after a long day working or exploring the Columbia area? 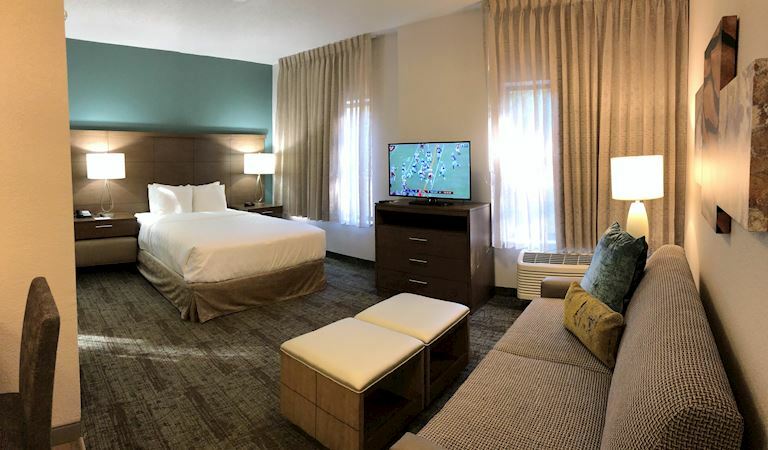 You'll feel right at home in either in the stylish bedroom with its premium Queen bed or the spacious living room with its fully-equipped kitchen and dining area. 710 sq. 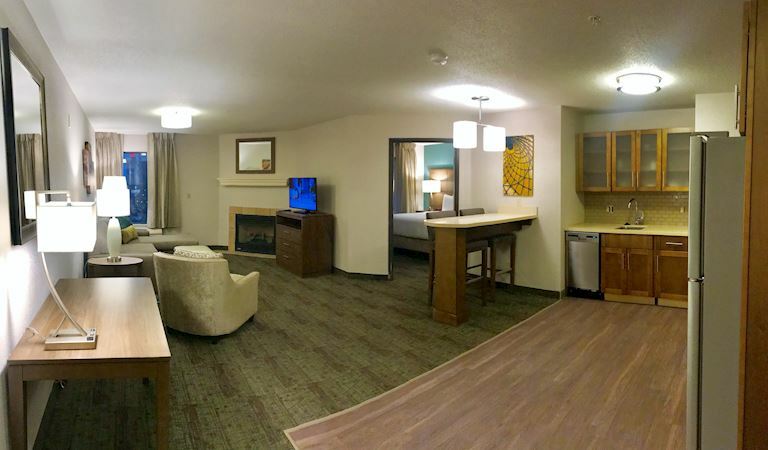 ft.
With a private bedroom & separate living room with 55" flat screen TV, this 1 Bedroom King Suite is perfect for groups & families. Prepare some tasty bites in the fully-equipped kitchen for dinner & then climb into the luxe, King-size bed or the comfy sleeper sofa at night. 725 sq.ft. 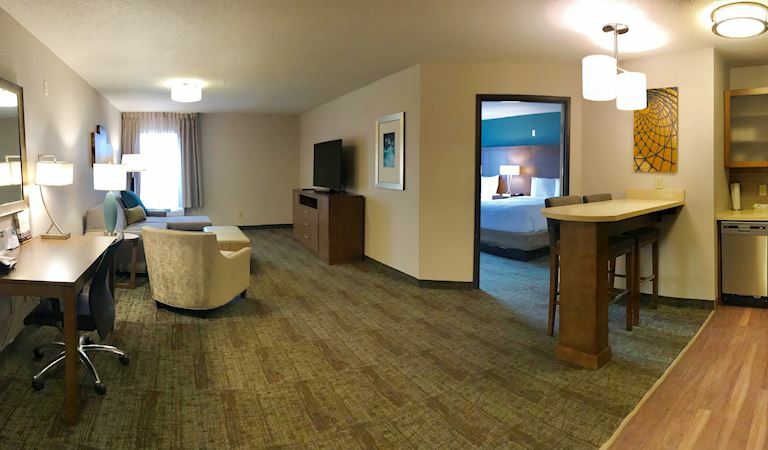 Relax in our 1 Bedroom Suite with 2 Queen Beds and feel like you're at home. 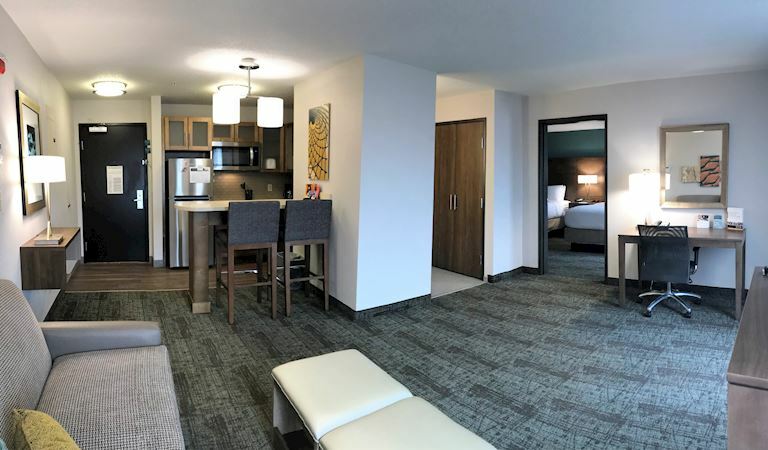 A stylish bedroom, well-appointed bath and a separate living room with sleeper sofa, dining area and fully-equipped kitchen are just some of the great amenities available in this spacious suite. 685 sq. ft. If you're traveling with family or friends, you'll appreciate our Deluxe 1 Bedroom Suite that features two premium Queen size beds. The living room area offers a full size sleeper sofa, 55" flat screen TV, well-equipped workspace and separate dining area and full size kitchen with cookware. Be it for business or pleasure, you'll love this spacious suite. 950 sq. ft.
Our Executive 2 Bedroom 2 Bath Suite features oversized rooms with a premium king bed in each room. With a spacious separate living room between the two, offering a full size sleeper sofa, dining area and chairs, 55" flat screen TV and a fully equipped kitchen with cookware, everyone will feel right at home. 1063 sq.ft. 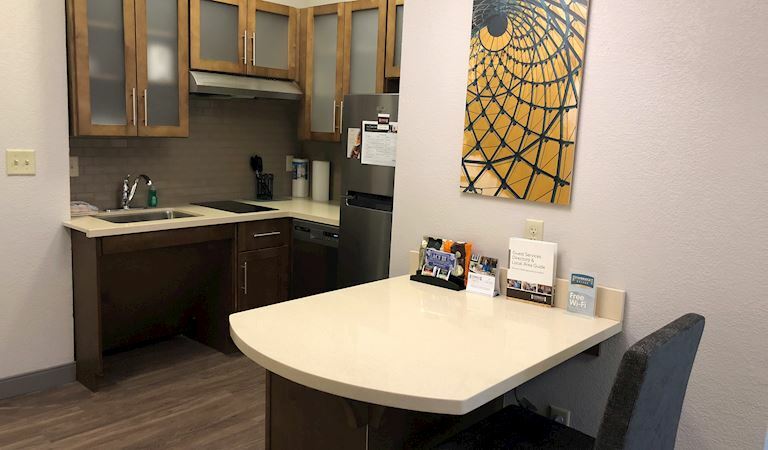 Our Standard King Room comes complete with a fully stocked kitchen where you can make a full meal or a quick bite before heading out for the day. At night, stretch out on your premium King size bed, watch a movie on the large flat screen TV or stay connected with free WiFi. 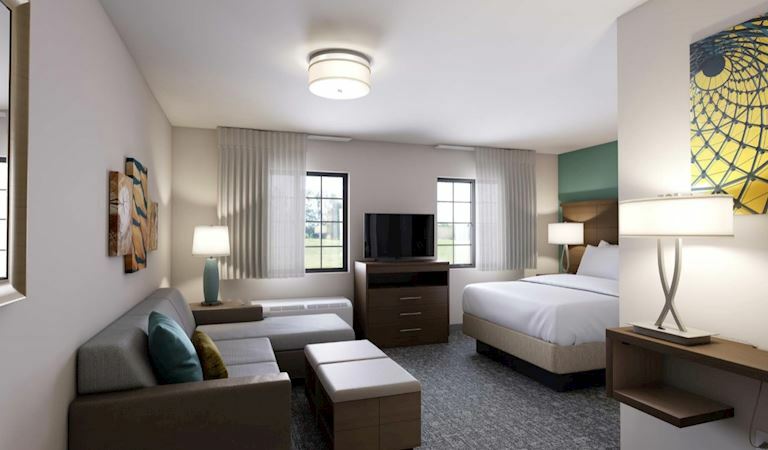 Either way, this room offers the perfect respite for the business traveler. 338 sq. ft. Enjoy the convenience of an ADA compliant roll-in shower and easily accessible bathroom in our spacious 1 Queen Studio Suite. 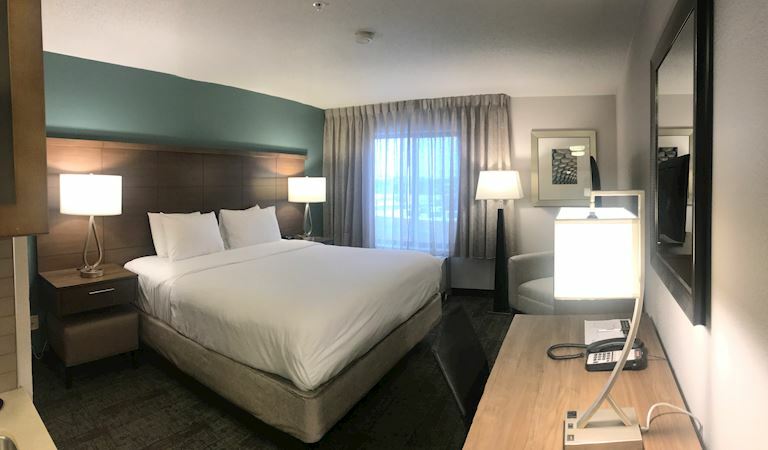 Offering a deluxe Queen size mattress with premium Beautyrest bedding, plus a comfortable sleeper sofa and our specially designed kitchen is complete with a low bar area for a generous workspace or dining area. You'll feel like you're at home from the moment you walk in the door. 461 sq. ft. It's easy to use the convenient roll-in shower and ADA compliant bathroom in this spacious 1 Bedroom 1 Queen suite. Featuring a bedroom with a deluxe Queen bed and flat screen TV and a separate living room complete with a sleeper sofa. Our specially designed kitchen is complete with a low bar area for a generous workspace or dining area. You could move in for a few nights or a few weeks. 550 sq. ft.